Discovered at Savers, a classic Rumer Godden novel and one of the few I didn't already possess. 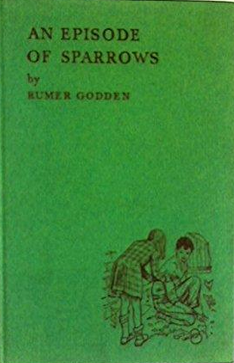 First published in 1955, An Episode of Sparrows has been labelled as a children's book, but it isn't that; it's that rare beast, an adult novel about children (mostly). If Rumer Godden were a pen, she would be a very fine, precise nib which makes clear, delicate portraits. Her writing is fine in every sense. In a way, An Episode of Sparrows is an updated version of The Secret Garden (another eternal favourite of my childhood): in grimy, scarred, post-war London, two children conspire to make a hidden garden behind a church; are discovered and thwarted; but ultimately saved. When Alice was younger, there was one episode of Friends that she couldn't bear to view -- the one where Joey buys Chandler a hideous friendship watch that Chandler loathes. Alice couldn't stand to witness poor Joey's hurt. In a similar way, I think as a child I would have found this book unbearably painful. The characters are too poignant. Poor little Lovejoy, patiently waiting for her flighty mother's return. Brave Vincent, struggling to provide nothing but the very best in his little restaurant, even if no diners come. Quiet Olivia, who watches everything and does nothing -- until the end. Kind Father Lambert, wise and lonely. Even mean, bitter Cassie has her own troubles. This is a beautiful, tender book, but be prepared for a few lump-in-throat moments along the way. I bought this book so long ago, my copy doesn't have the award stickers all over it. I've been hanging onto it because I knew we were going to read it for the Convent book group, which means I have arrived very late to the loving-Words-in-Deep-Blue party, but it was worth the wait. I just love Cath Crowley's writing. When I read her books, I get writing envy. She writes the kind of YA I want to read -- gentle, funny, searing, sorrowful, filled with sweet, witty dialogue and characters you wish you were friends with (or that you wish your kids would hang out with!) 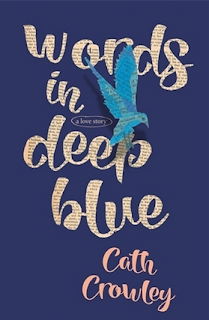 Words in Deep Blue has the added bonus of being set in and around the second hand bookshop of dreams -- with a reading garden and a Letter Library where people leave heartfelt notes between the pages of the books they love best. This novel is a love letter itself, a love letter to books and reading, to the power of words to heal and transform. What a beautiful book. I loved it. 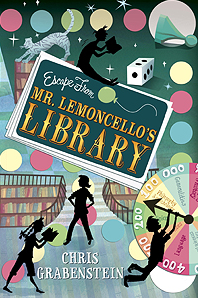 Our upcoming theme for the Convent book group is Books, appropriately enough, and Chris Grabenstein's Escape from Mr Lemoncello's Library is our junior fiction title. This book was a lot of fun, with conscious echoes of Charlie and the Chocolate Factory, but with books instead of sweets. A team of lucky kids win an overnight stay in a brand-new, whiz-bang library built by a famous inventor; but there's a catch. They have to solve the clues Mr Lemoncello has planted in order to get out! Naturally, the clues are literary ones, but even our hero Kyle, who doesn't enjoy reading, can use his wits to piece together the solution. If Grabenstein succeeds in pointing any readers to the many books he references in this enjoyable romp, then he has truly performed a service. Mr Lemoncello also speaks in dialogue lifted from famous children's books, which adds a layer of fun for the adult (or widely-read) reader. Apparently this book has also been made into a movie, though I haven't watched it -- no doubt someone in my very conscientious book group will have done so. I'll wait for their verdict before I give it a go. However, it was a very interesting exercise to read the two books side by side and I don't regret my double purchase. 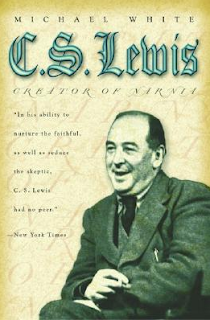 CS Lewis: A Biography by AN Wilson was published in 1990. It's a dense, scholarly work, somewhat dismissive of the Narnia books, which Wilson claims are 'poorly written', albeit in the throes of 'white hot' emotion. Wilson places more value on Lewis's academic work and his religious apologia. 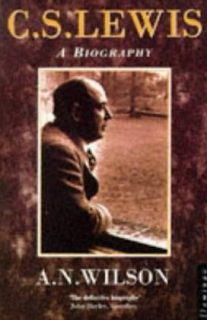 He is clear-eyed and unsentimental about Lewis's complicated private life, and his personal weaknesses, and is disdainful about the body of work (which I was unaware of) by hard-core Christian fans which seeks to paint Lewis as some kind of saint. Michael White is similarly scornful about the blinkered sanctification of Lewis. But his biography, CS Lewis: Creator of Narnia, published in 2005, is written from the viewpoint of an unashamed Narnia fan. White has had an interesting life himself, including a stint in the Thompson Twins (! ), lecturing in science at Oxford, and writing on science for GQ. He gives Lewis's fantasy writings pride of place, the central chapter of his book, and while he covers much of the same ground as Wilson, his book is organised by theme rather than strict chronology, which can be a little confusing. White's book is lighter, shorter and perhaps marginally more readable than Wilson's, and the positive attitude to the Narnia series is refreshing; however, Wilson's is probably more informative. Needless to say, neither writer has picked up on the 'planets' theory. But I certainly know more about Jack Lewis the man and writer than I ever knew before. 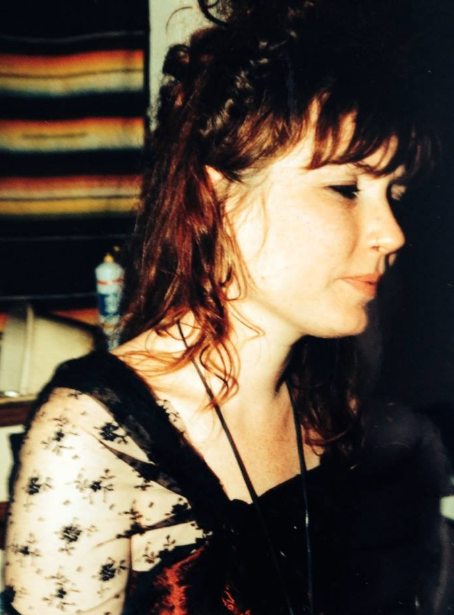 I first met Alyson Watt almost thirty years ago. She came to a share-house interview, a Scottish backpacker with a heavenly accent and wild red hair. A couple of minutes into the conversation, Andy and I looked at each other; without words, we knew she was the one. Warm, funny and gorgeous, Alyson took the top room of the big terrace house. She didn't understand that in an Australian summer, you shut the windows and close the curtains to keep the heat out. As a Scot, she thought the right tactic was to open the windows wide, in case of a cooling breeze. We had to explain to her that there's no such thing in Melbourne in December. Before long Alyson was joined by Jo, and the two of them became 'the Scottish girls', an inseparable pair. When our lease ran out, Liz and Alyson and Jo and I rented another house together, a tiny run-down workers' cottage in North Carlton, just the other side of the cemetery. Jo and Al crammed into the third bedroom; there was just enough room for two mattresses and a rack of op-shop dresses. That was a year of chocolate puddings and beer, curries and chips, Doc Martens and cotton frocks, bikes in the hallway, silly hats and the Pixies and stupid jokes. I watched the fall of the Berlin Wall in that house. But by then the Scottish girls had moved on, backpacking their way north and eventually home. A couple of years later, it was my turn to be the backpacker. I landed in their flat in Edinburgh and stayed there on and off for months, through the weird midnight sun of summer, then with Chris in a golden Scottish autumn and finally the bleak perpetual dusk of an Edinburgh winter. It was Alyson who cuddled me on her knee when I was homesick, and Alyson (working as a nanny) who told me I was 'good with kids.' That was Alyson -- generous and kind and always knowing the right thing to say. Alyson hated flying so she never came out to Australia again. I saw her one more time when I went back to the UK in 1998. I never dreamed that would be the last time. Because Jo comes and goes often between north and south, we always knew what was happening in Alyson's life. Our last exchange on Facebook was only a couple of weeks ago. One day soon, Liz and Chris and I will find a pub somewhere and have some drinks for Alyson; it's the only way we've got to say goodbye.